I made our first trial cheese! 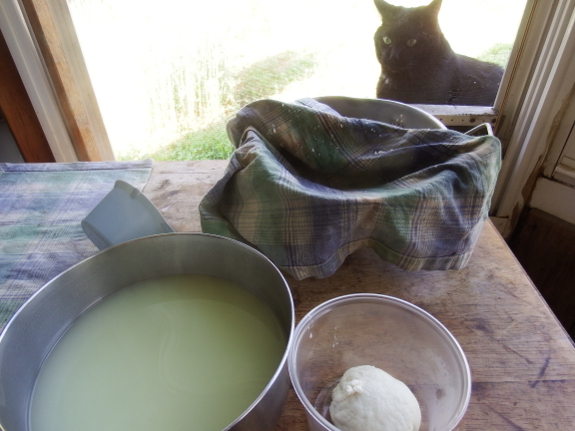 I suspect this is most people's first cheese because it can be made with normal kitchen supplies --- a quart of goat's milk, 1/4 cup of lemon juice, a jelly thermometer, a clean cloth, and a collander. 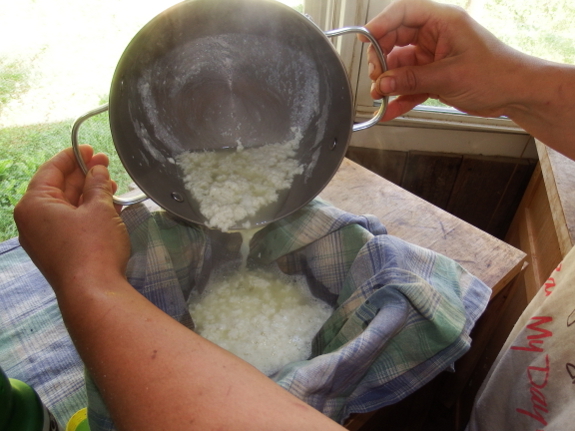 Just slowly heat the milk to 180 degrees, add the vinegar, watch curds form, then strain through the cloth. Nearly instant cheese! If you want, you can finish by adding salt, garlic, herbs, or other seasonings. I kept it simple with a dash of salt and found the cheese tasty, but nothing like the goat's cheese I've had from the store. Instead, this simple lemon cheese tasted more like mozzarella. The amount of whey to discard is rather daunting, though. A search of the internet turned up the fact that there are two types of whey --- acid whey (which this is) and sweet whey (from cultured cheeses). Sweet whey has scads of uses, but acid whey is less malleable. So I'll probably end up giving the whey to our animals (whichever one likes it best). I use our leftover whey when making soap, smoothies, or pancakes. Whey will store for a long time in the fridge and has a lot of uses. We use it as a boost in lacto-fermenting, and also for soaking grains. When I started making cheese I found this website pretty helpful. Eric --- Thanks! I'd been pointed there before, but hadn't really looked around. I suspect their beginner series of cheese lessons might be better than a book. I have perused the web once or twice looking for different uses for the whey we get when we make occasional batches of homemade yogurt. Seems like the primary use is in bread, which i can do just fine (there's a raisin-cinnamon-english-muffin bread loaf that i fall to pieces for, and it has very little sugar). But uses other than in bread/grain products seem harder to find. I did read once that you can cook veggies in the whey, but I can't image that's a flavor profile I'm looking for when I eat my veggies. Otherwise, I don't know what to do with it. I do agree it lasts a long time in the fridge. Several of you chimed in about whey, so I thought I should weigh in as well. I ended up just bringing ours to the goats...and the first goat to get her head in the bowl (Artemesia, lowest goat on the totem pole) loved it so much that she refused to let anyone else near it. In 30 seconds, it was gone! So, if you don't have a use for it, sending it back into the goats is definitely very workable.